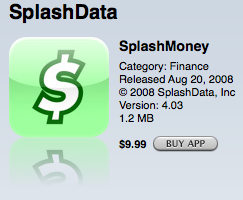 SplashMoney, from the folks over at SplashData, Inc., is now available in the iTunes App Store for $9.99 with a desktop version available for $19.99. SplashData's products have been ever-popular on other platforms, such as Palm, Windows Mobile Pro and Smartphone editions, and BlackBerry. Now, they have taken the plunge and offered up some of their goodies for iPhone. 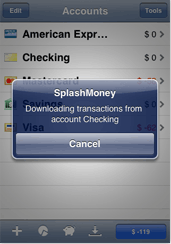 How does SplashMoney for the iPhone measure up? Read on for the full review! Ever since I replaced the old paper planner with a shiny PDA, I have looked for ways to eliminate paper and consolidate all of my information into one electronic brain. One of my favorite apps over the years has been a little checkbook register app for my Palm -- it allowed me to leave my checkbook register at home and input my financial transactions as I spent my hard-earned cash. Now that I'm an iPhone user, I was immediately intrigued about SplashMoney and knew I had to give it a try. SplashMoney isn't perfect - a few bugs need working out and I experienced some crashing while setting up accounts - but it is a very promising financial app for your iPhone with some powerful features. It offers a rather simple user interface but has quite a bit of power under the hood. It impresses me as the kind of app that you would expect to find on your desktop, but instead have the luxury of carrying around with you on your iPhone. When first running SplashMoney on your iPhone, you are welcomed with a splash screen for the first 5 seconds. This can become an inordinate amount of time if you want to gain quick access to your accounts, and that's one thing I would suggest to SplashData -- either drastically shorten the splash screen time or provide an option to disable it after the first time. Setting up your accounts is rather simple to do. With SplashMoney, you have the option of either managing your accounts manually or connecting and syncing the financial data and transactions from your bank or other financial institution (i.e., credit card company). The list of available banks is extensive and I was pleased to find my credit union on the list. The top part of the Account screen has an "Edit" button for editing your accounts and a "Tools" button to adjust various settings, from setting a password and editing payees and categories to Syncing your data to the desktop app (sold separately) or running the Quick Start Guide. 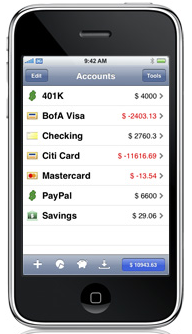 Along the bottom of the screen is a " + " for adding new accounts, a pie-chart icon for Reports, a piggy-bank icon for managing your Budget, and a "download" icon to download your financial data to your iPhone. Additionally, there is a running balance indicator that you can customize to reflect any and all of your accounts. Given my personal financial situation, it is far more morale-boosting to just include my checking account balance so the number stays in the "black" as opposed to a "red" number with a negative to the left. It was during the account setup period that I ran into some bugs -- sometimes SplashMoney will reset, particularly when you are in the middle of downloading the financial data online from your accounts. Hopefully this is an issue that will be resolved in future updates. Even with the reset nuisances, the ability to sync up and download your current balances and transaction histories is a tremendously positive feature for me. I like to see what's happening in my accounts while I'm on the go, and SplashMoney does a good job of displaying that information for me. SplashMoney is quite feature-rich yet simple to use at the same time. You can use it simply as a checkbook register, or take advantage of the many features it offers as a powerful finance and budget app. It supports several different types of accounts, including checking, savings, credit card, asset, liability, money market and line of credit. 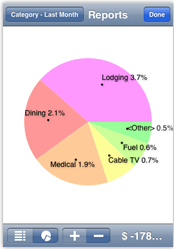 It supports categories, classes and splits, which can be very handy when you are ready to run reports to get a visual representation of your finances. SplashMoney also supports multiple currencies and online real-time currency updates. Custom icon support and the ability to print registers and reports are also included features, as well as scheduled transactions and reminders. Some people may be hesitant to use the online account update feature, but fortunately there is secure password protection using Blowfish encryption. 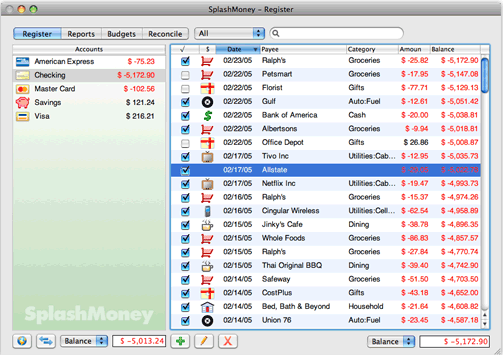 Although it's an additional $19.99 for the desktop app, it's money well-spent and provides a powerful one-two punch for your SplashMoney finance and budgeting experience. Even though the iPhone app is easy to use, I quickly found the benefit of using the desktop app for managing my accounts and then syncing the data wirelessly to my iPhone. You can either sync via your WiFi connection or set up an ad hoc connection for even more security. It's nice to have the backup and redundancy of my financial data on both my iPhone and desktop. I'm using the Mac version and syncing my data was painless. You can download a 30-day trial of the desktop app to see if it's right for you. As I mentioned in the beginning, SplashMoney is a bit rough around the edges with respect to some bugs and occasional crashing, and I had a little difficulty syncing a couple of my more obscure online accounts. But in the final analysis, it's a great effort and will undoubtedly continue to be a top contender as Splashdata makes improvements. The iPhone version is priced right at $9.99 and the desktop app is also reasonable at $19.99. I would be far more pleased if I had more money to manage and see more balances in the "black", but that's not SplashMoney's fault. In fact, I look forward to delving deeper into the features and utilize budgets and reports to manage my money better and watch with satisfaction as more of those "red" balances turn to "black." SplashMoney offers a nice user interface on the iPhone and desktop app alike, and the ability to sync online with your accounts is a really nice touch. The app is simple to use but offers up very powerful features that can please the novice and power-user alike. I look forward to seeing future updates and see just how polished SplashMoney can become.